Free - Cordova CLI is open source. Use the latest plugins: Sometime developers have newer versions of their plugin that are not in PhoneGap Build yet. Use PlugIns which are not in PhoneGap Build at all. Use custom PlugIns you have developed yourself. More complicated to get working (and keep working). Install Android Stand-Alone SDK Tools: http://developer.android.com/sdk/installing/index.html?pkg=tools. This installer will check if you have the Java SE Development Toolkit (JDK) installed - if not, it will prompt you to install it. Full installation will use about 2 gigs of disk space and may take a while to download. If all goes smoothly, you should not need to mess with your PATH variables. Otherwise, look at the above linked documents for hints. PhoneGap CLI looks for a number of files in your project folder (or elsewhere if you have specified in Preferences). When you start a new project, you need to run a command to initialize the the directories. When you do a deploy from AppStudio, it updates these directories with your code. This will create a phonegap directory in your project and set it to make Android apps. Replace 'helloworld' with the name of your app in the first command. Add your 'icon' and 'splash' folders to it. The folders which come with the AppStudio PhoneGap samples will work fine until you substitute your own images. The whitelist plugin is added automatically. In AppStudio, go into the Preferences screen. The Build Path will default to your project folder. If you initialized PhoneGap as specified in the previous step, you do not need to do anything. The Build Command will run after the AppStudio saves your project into the phonegap directory. In this case, it will build your app and run it in the Android emulator. The contents of this field are standard command line format. From the Run menu, choose "Build Native App with PhoneGap CLI". The apk file will be created in phonegap/platforms/android/build/outputs/apk/android-debug.apk. The package name is taken from the configxml property. The Android SDK installed the Android Emulator. Using AVD Manager.exe (start as Administrator) you can set up a configuration. It will default to 2048K: if you are running on Windows, change that to a smaller number (like 768). Smaller screens will initialize and run faster. We don't recommend using the Emulator. It is too slow - the first start of it can take 10 minutes or more. You're better off to have an actual device connected by USB cable: it will load and run your apps quickly. The regular Chrome Debugger will then appear and you will have full control of your app. The names of the plugins are the same as in the config.xml file. This requests permission for your app to access the network, and allows your app to make calls to any domain. It is also a good idea to make your calls asynchronous, using a callback function when Ajax() returns it value. Now create a file named ant.properties in the same folder. Enter these lines into this file, replacing HelloWorld with the name of your app and myPassword with the password you used to create the keystore. The standard Cordova CLI release build process will now prompt for the passwords and automatically sign the apk, ready for distribution. 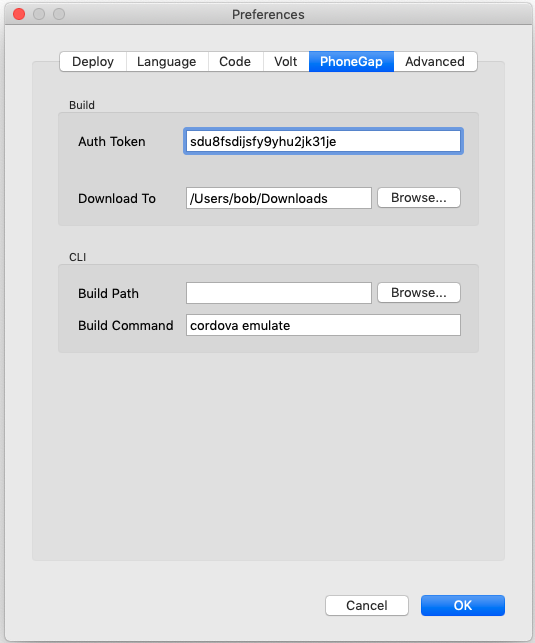 CordovaApp-release.apk will be created the same ant-build folder as the debug version. Make a www folder in the root of the NSBASIC app. Images must be lowercase with no numbers or special characters in their name! This page was last edited on 11 July 2016, at 19:09.